The method I was using for the pinwheels was not making me happy. Thus, I decided to make different blocks. 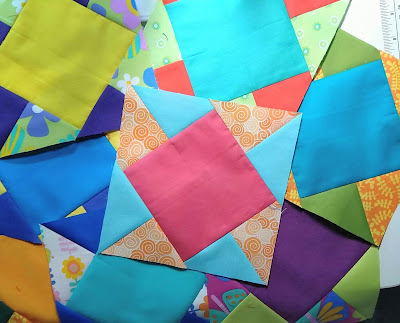 The pinwheel blocks will still be used in the quilt, but I have to decide how I will use them. The new blocks came about after I messed up an attempt to find another way to make pinwheels. Let me just say I wasn't quite ready to start making 3D blocks- and those were 3D. Some quality unsewing, frogging, seam ripping helped. But what to do with the pieces at this point? I had what was essentially two triangles that made a half square. But if I just sewed them together each color was beside its like color....Hmmmmm. What is that old saying? If life hands you lemons, you make lemonade. I have no clue if this is a traditional block but until I learn better, I call it "Lemonade Squared." After making the first one "the hard way," I figured out the easy way to make the block. I used my Accuquilt Quarter Square cutting die that makes a 4 inch finished block. I sewed two of the pieces together on the sides to make a half square triangle. Then I used those triangles to sew to the sides of a square. It makes a "Square in a Square" but with fancy corners. These blocks are fun and easy for me to make. But the best part is that every one of them has come out great every time. I may take a pinwheel and trim it from 5 1/2" down to 5" and use those as centers. It will use up the pinwheels and add a few surprise blocks into the final quilt. I am wondering if any of you do what I call "experimental piecing" as you make quilt blocks. As my longtime readers know, I love to say "what if????" ---and of course give it a try. Your 'what ifs' are always magnificent and this one is no exception. How fun! I must leave the experiments to you, Gene. I like your reworked version of pinwheels, and now I see many center spaces for some of your expert embroidery! I love to experiment...one of my most fun things to do. I love your block! Your block looks very much like an "oldie" pattern called Sugar Bowl. The coloring might be a little different from what I remember but it is a great use of "spare" parts. I enjoy reading about your experiments. What a great name! And I loved reading about how your block came about! (Apparently when I reply to blogger - it comes out as "no reply." And I don't see an option to change that. I love your Lemonade Block!! Looking forward to see how or if you combine these with your pinwheels. I love your fabric choices for both. Cool block! I use Triangulations to make my HST's, then put them together to make pinwheels. I've made lots of pinwheels over the years.